Rhode Island Quality Institute and PeoplesBank were recently recognized as Employer of Choice Award recipients by the Employers Association of the NorthEast (EANE). 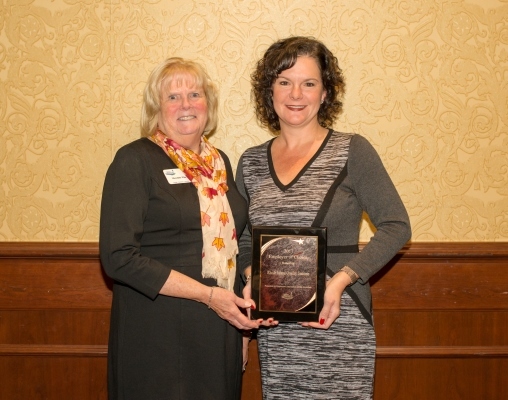 The awards were given at EANE’s Employment Law and HR Practices Conference luncheon at the Sheraton Monarch Place in Springfield, MA on November 2nd. Employer of Choice awards recognize companies and organizations for developing workplaces that value employees, foster engagement, invest in training and reward performance. Past winners view the award as a cornerstone of their company credentials and often highlight the award in recruiting and retention, grants and funding applications, and business development. All winners receive a professional, customized video that spotlights the organizations's achievements. Rhode Island Quality Institute showcased how all employees are deeply engaged and committed to its mission and core values. The organization has closely linked its core values to every aspect of employment lifecycle, including recruiting, onboarding, performance management, wellness programs and more. Its peer recognition program was outstanding. Based in Providence, the Rhode Island Quality Institute’s (RIQI) mission is to significantly improve the quality, safety, and value of health care in Rhode Island. www.riqi.org See the video here. ​PeoplesBank showed their significant cultural push for employee innovation, engagement, performance and development. Working with their team of highly committed employees, they focus on customer satisfaction and caring for their communities and the environment. The tagline “A passion for what is possible” is evident. Based in Holyoke, PeoplesBank is the largest community bank in Western Massachusetts providing banking and other financial services. www.bankatpeoples.com See the video here. Employers from Massachusetts, Connecticut and Rhode Island who have been in business for at least three years and have a minimum of 25 employees are eligible to participate; both the company size and its resources are considered in the screening and selection process. Entrants are judged in areas that include: company culture, training and development, communication, recognition and reward, and more. Winner Photo: Pictured here are EANE’s Meredith Wise (left) with RIQI’s Michelle Dexter.